Former Whitby Town midfielder David McTiernan revealed that Alun Armstrong was his main motivation for moving to Croft Park after Blyth Spartans’ newest arrival finalised a move for an undisclosed fee on Thursday evening. The 32-year-old, who made 435 appearances in four spells at the Turnbull Ground, scoring 48 goals in the process, signed official confirmation following his first training session at the club, despite news of his arrival being broken hours before the deal was completed. After featuring alongside Blyth boss Armstrong at Newcastle Blue Star back in 2007, McTiernan said he had no hesitations in swapping second place for first in the Evo-Stik Premier League once he was made aware of his former teammate’s interest. He said: “I’m delighted to be joining the club. There’s a great set of lads here and I’m just raring to go. “Alun was the main reason for me signing. I’ve known Alun a long time after we played together at Newcastle Blue Star when I was there for a brief stint. “I also know him through Middlesbrough from coaching, so when the deal came about I was glad to get it done quickly. Following Stephen Turnbull’s departure from the club due to work commitments, for the second season in a row, Armstrong moved quickly to fill the void left in his squad. However, McTiernan was quick to quell any talk of him replacing the departed ‘Twinny’. The central midfielder was part of the Whitby side that beat Blyth 2-1 on Boxing Day, but he revealed that he has not been surprised at Spartans’ run of nine consecutive wins since that result as he is rarely shocked by anything in the Evo-Stik Premier League. He said: “Nothing really surprises me in this league. 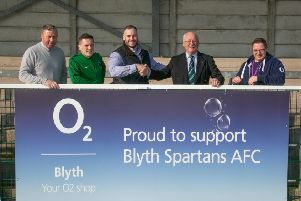 I didn’t really see Blyth pulling away as such, but they’ve done brilliantly since the loss at Whitby. With a 12-point lead at the top of the table with just over a quarter of the season remaining, Spartans face the real possibility of returning to the Vanarama National League North for the first time since 2012. Having already played at that level for Harrogate Town earlier in his career, the prospect of promotion excites Armstrong’s latest signing. McTiernan said: “The chance to get back into the Conference North is another huge factor [in my decision to sign]. “The fact that the boys are at the top of the league and everyone is competing for places in the team, it’s going to be hard.